It’s never too early to plan a fun and fabulous beach wedding for next summer! We all know how the preparation period can whiz by. So, even 3 seasons ahead, we thought we’d take you sailing through some gorgeous inspiration for a wedding by the ocean. We’re showcasing seaworthy looks and styles to focus your theme on. Plus, we’re featuring ideas for decorations, bridal bouquets, wedding cakes, and cocktails—as well as our picks for bride and bridesmaid dresses, wedding invitations and programs, and favors and welcome bags. All in celebration of the romance and beauty of a wedding on the beach! The possibilities for a seaside wedding theme are so varied and fascinating. Here are 5 looks from our own styled sets to set you off on your planning voyage. 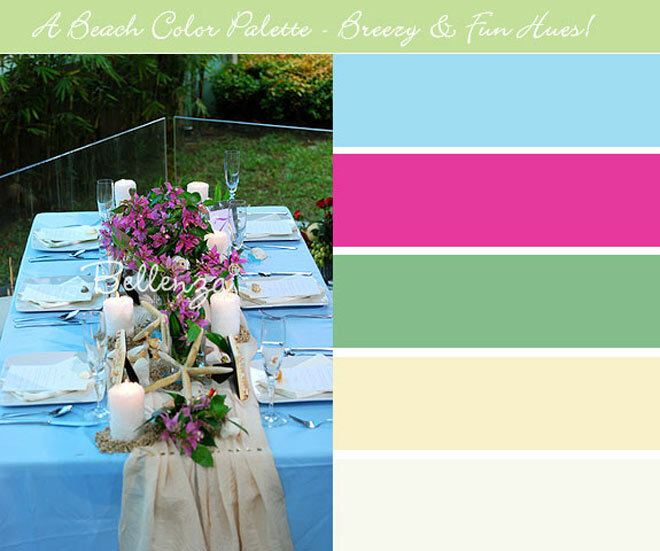 For a breezy, casual chic vibe, consider a color palette of sea and sky blues paired with sandy neutrals (shown above). Then for contrast, create a runner-style vignette of fuchsia bougainvillea with dried starfish, seashell place card frames, and candles on little islands of sand. Envision stretches of golden sand under a romantic sunset. Then make that your peg for a dreamy “castaway” setting created with neutral tones and ivory, highlighted with touches of gold and coral. A seashell dish could serve as your alternative ring pillow, and be given as a lovely gift to the mothers of the bride and groom. Let nature take center stage at your beach nuptials with an organic color scheme of ivory, straw, and leafy green—brought in through foliage, fiber, fruits, and shells. Oh, and a dash of orange in tropical blooms! Look no further than what a seaside location has to offer—and use the natural charm of these elements to style your beach wedding tablescapes. In place of floral centerpieces, for instance, use lush tropical plants with shapely leaves, colorful arrangements of tropical fruits, or floating candlescapes. Think vibrant red, pink, orange, and purple amidst lush green, and there you have an island paradise ambiance for your summer wedding. Use tropical print table linens, centerpieces of orchids, bromeliads, or hibiscus, and twinkling votives in raffia-wrapped glass cylinders. And for even more beach wedding styles: boho beach and modern boho beach. 1 – Summer Beach Wedding Celebration Card – A starfish, seashells, and sand say it all for a beach wedding in this card available via Zazzle. 2 – Luxury Wedding Invitation – If you’d like a more luxe design, consider this ivory pocketfold style invitation with shimmer. Ships from and sold by PaperStudioByC, via Amazon. 3 – Beach Destination Wedding Programs – Both pretty and practical for a sunny ceremony, these hand fan programs can be ordered via Amazon. 4 – Orange Flowers Destination Wedding Invite (Hawaii) – A 3-fold photo invitation in bright orange with an exotic hibiscus design, available from Purple Trail. 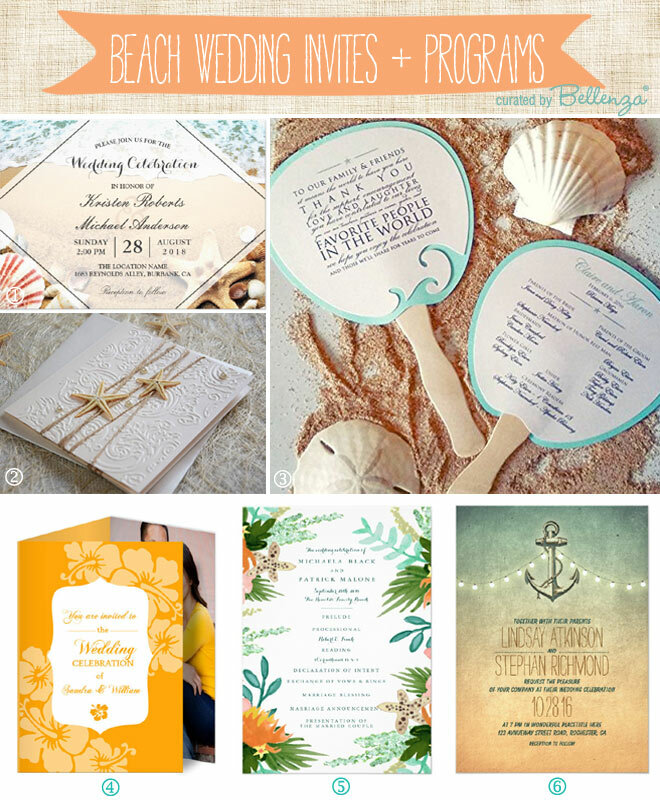 5 – Coastline Wedding Programs – Colorful beach botanicals frame this handpainted style program from Zazzle. 6 – Rustic Lights Nautical Anchor Wedding Card – Go for a shipshape look, as in this wedding card you can purchase from Zazzle. A beachside location is a decorator’s dream, thanks to all the natural gifts from the sea. So, when it comes to your wedding tablescapes, all you need to do is assemble and arrange! 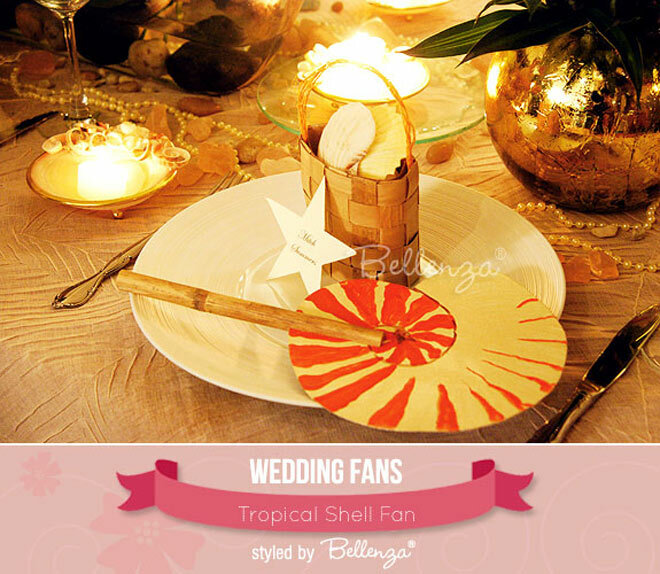 Tropical Shell Hand Fans – For the crafty DIY couple, consider making your own hand fan wedding favors in different shell designs. These would make eye-catching accents on each guest’s place setting, too, paired with tiny baskets of seashells. Exotic Wedding Centerpiece Using Coconuts – Go all out authentic with centerpieces featuring tropical leaves and flowers arranged in actual coconut shell vases. Visit our see-and-do guide here. Seaside Elegance with Shells and Pearls – Take a sophisticated approach to beach wedding decor by incorporating assorted seashells, strings of faux pearls, and sand-covered table numbers on the tablescapes. For added glitz, light the scene with tea lights in pretty shell dishes. Seashell Frames as Place Card Holders – If you’re looking for decor items that double up as table elements and wedding favors, these handcrafted shell frames are just the thing. At the reception, dress them up with ribbon and sprigs of flowers to match your color scheme. Pearls for a Beach Luxe Look – Create an upscale air with pearl elements throughout your table setting. Think about incorporating pearl candle coasters, vintage favor bags with pearl-handles, and even “chargers” made from strands of pearls! Seashell Place Card Holders – There are so many ways to make your own beach wedding place card holders. You could go fully DIY or add your own creative touches to ready-made ones featuring real seashells. 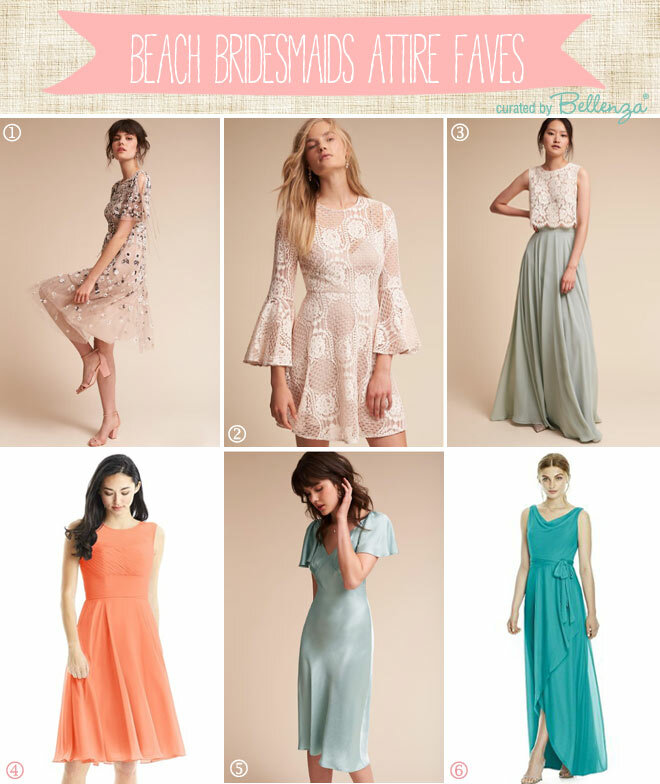 1 – Bella Dress & Sarita Lace Duster – We love the versatility and light, flowing ease of these separates from BHLDN. 2 – Havana Corset Top & Jordan Skirt – A figure-hugging top pairs with a twirl-ready midcalf skirt, both available via BHLDN. 3 – Iva Crepe Maxi – This ivory maxi dress by Jill Jill Stuart via BHLDN would create a stunning svelte figure for a beach bride. 4 – Adrianna Papell Floral Beaded Blouson Gown – Sparkling beadwork on floral tendrils adds a hint of glam to this floor-length gown available from Macy’s. 5 – Duchess Gown – For a feminine floral look, this tea-length dress by Marchesa Notte via BHLDN offers 3D flowers and metallic embroidery. 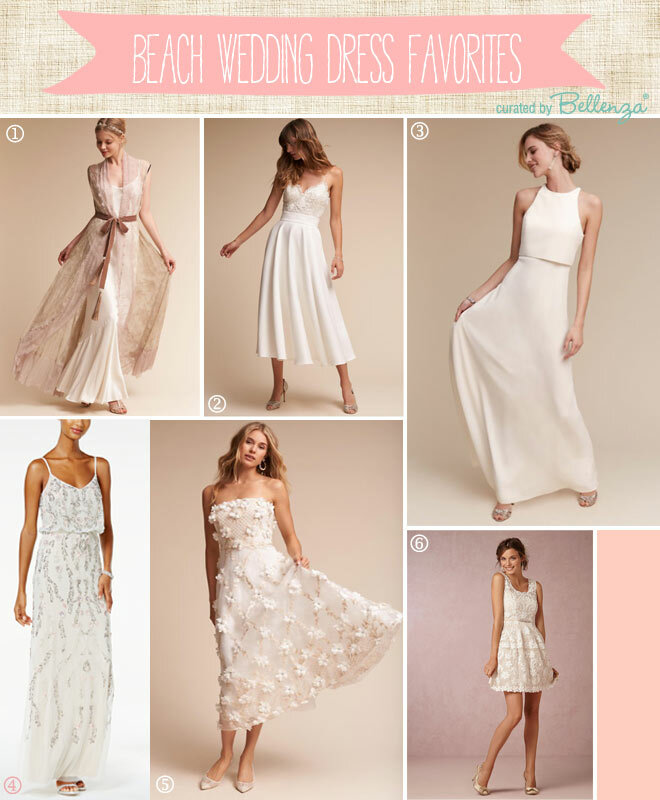 6 – Ivory Lavinia Dress (Yoanna Baschi) – Short and flirtatious—just the right dress for the petite bride available via BHLDN. Bright Summer Colors – Summer is the season of bright, bold floral hues! 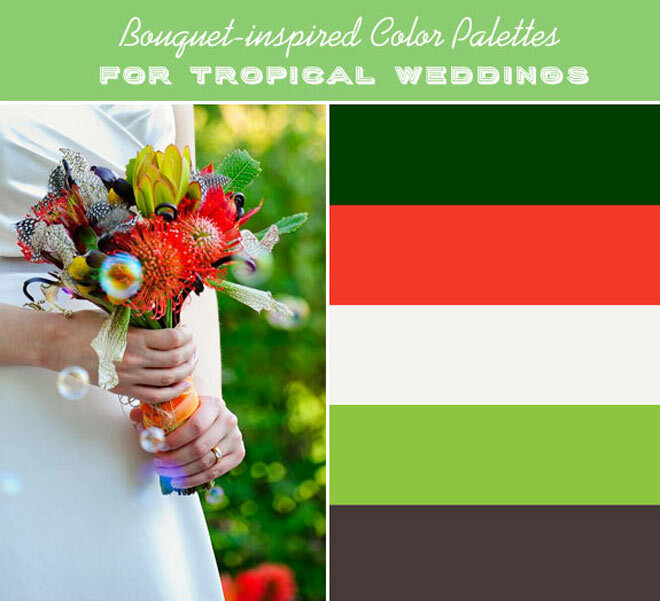 The tropical bouquet shown above is a gorgeous example of this (plus more in the same post), inspiring entire wedding color palettes celebrating the sunny weather. Bouquets of Tropical Florals – Take advantage of the flamboyant flowers of the tropics to design a striking bouquet. Consider using orchids, calla lilies, frangipani, hibiscus, bromeliads, protea, even birds of paradise. Single Fresh Flower Bouquets – Precisely because summer blooms are such lookers, you can get away with a trendy single-flower bouquet. Or ask your florist about creating the illusion of one giant bloom by wiring additional loose petals to a central flower or tightly bunching together perfectly matching flowers. Dazzling Orchid Bouquets – The intense purple of tropical orchids makes a fabulous floral statement for a beach bouquet. That was the inspiration for Pantone’s color of the year for 2014, Radiant Orchid, still sure to dazzle on your wedding day. Sunny & Bright Yellow Bouquets – It’s like bringing along sunshine in your walk down the aisle! Choose arrangements of the cheeriest yellow flowers, like calla lilies, tulips, daisies, billy balls, sunflowers, and cymbidium orchids. 1 – Bobbi Dress – A hint of champagne color is just one of the charms of this airy short dress, by Needle & Thread via BHLDN, with beaded florals on tulle fabric. 2 – Russo Dress – This above-the-knee dress in ivory crocheted lace, by Donna Morgan via BHLDN features fun bohemian-inspired bell sleeves. 3 – Cleo Top & Hampton Skirt – A sweet, young lace top gets a sophisticated air with a flowy, floor-length skirt in morning mist. Another lovely combination of BHLDN separates. 4 – Scarlett Dress – Inspired by the colors of summer, choose this pretty knee-length dress from Azazie in papaya-colored chiffon. Pleats on the bodice and an A-line skirt add to the feminine effect. 5 – Giselle Dress – This satiny number by Ghost of London via BHLDN features a figure-skimming knee-length sheath with fluttery cap sleeves. It comes in several colors, but this “sky light” is lovely for the beach. Depending on the particular theme you’ll choose for your seaside nuptials, there’s certain to be a wedding cake design to complement it. See the range of cake styles you can select from. 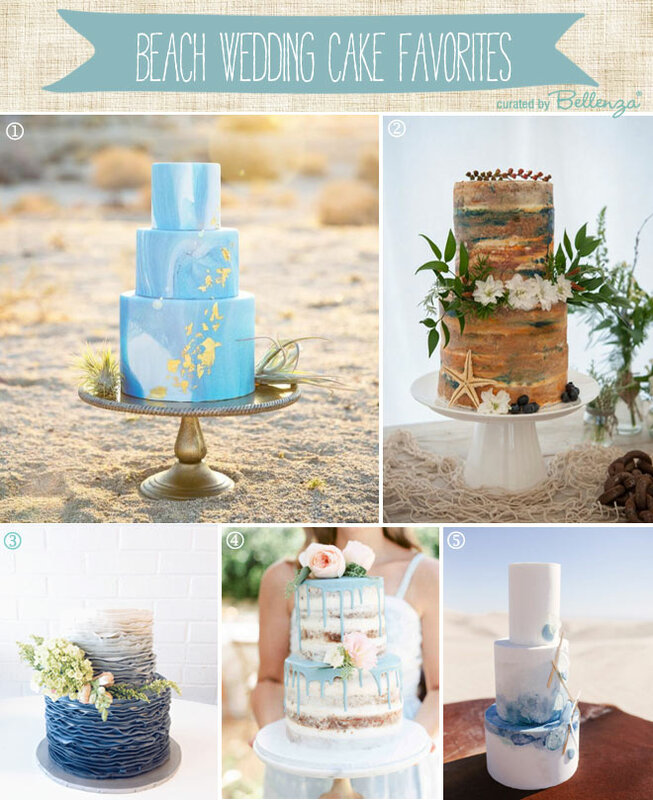 1 – Marbled Cake – For a modern beach wedding, this type of cake (found via Beach Wedding Tips on Instagram) echoes the look of ocean waves. Plus the gold leaf speckles add a touch of luxe. 2 – Rustic Semi-naked Cake – If you’d like a mix of woodsy elements, take ideas from this rustic-style cake by French Made Cakes (image via Pinterest) adorned with a leafy garland, dainty flowers, and a starfish! 3 – Ombre Ruffled Cake – Resembling miniature waves in a gradient of blues to white, this gorgeous creation by Suarez Bakery would be a real show-stopper at your wedding. 4 – Drip Cake – With its ocean-hued frosting, a lovely drip cake like this one by Beverly’s Bakery (featured on Martha Stewart Weddings) would make a sweet allusion to your seaside wedding location. 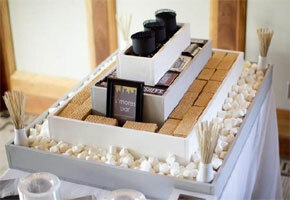 5 – Modern Minimalist Style – This simple three-tiered creation by Hey There, Cupcake! (featured on Brides.com) is right on theme for the beach, with its watercolor-style splashes of blue and sugar “sea glass” accents. Keep your guests hydrated and “in good spirits” with your choice of a beverage bar with a selection of ice cold cocktails, a “his and hers” drinks station, or a signature wedding drink to toast with. 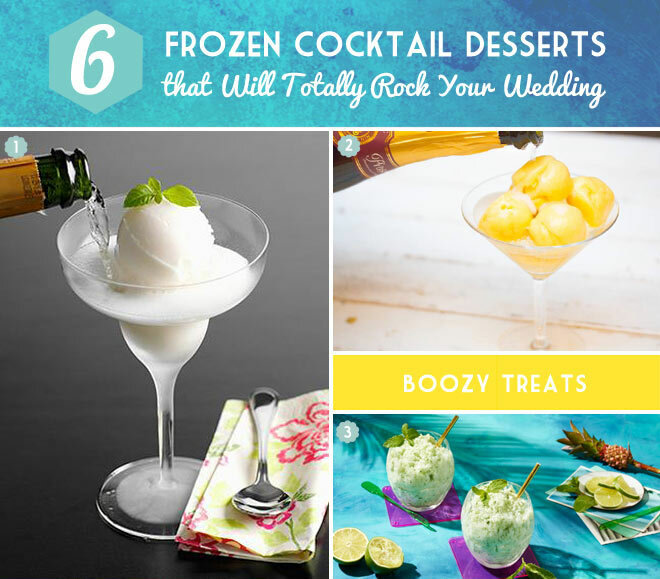 Frozen Cocktail Desserts – Definitely welcome at a sunny seaside wedding would be refreshing frozen cocktails that double as desserts, too! Summer Wedding Cocktails Made with Fruits – Incorporate the flavors and textures of summer fruits in drink concoctions that are as pretty as they are delicious. Rosé Cocktails for a Wedding Signature Drink – Speaking of pretty, why not serve a pink-hued cocktail made with rosé wine mixed with gin, sparkling water, and fruit? So chic for your reception by the sea. His and Hers Signature Drinks – A fun way to present a choice of cocktails to your guests is to serve your respective favorite drinks. And in keeping with the location, consider mixing up blue-tinted martinis, mojitos, margaritas, and Blue Hawaii’s. Spiked Snow Cones – Such a fun option for summer weddings! Not only are snow cones a sentimental childhood treat, but these spiked versions will be a special surprise. 1 – Kate Aspen® Beach Tides Welcome Bags – Say hello to each arriving guest with goodies and gifts presented in beach-themed bags like these from Michael’s. 2 – Single Use Camera – Beach Design – Such a cool and cute idea for an out-of-town wedding location! See the full camera specs via Weddingstar. 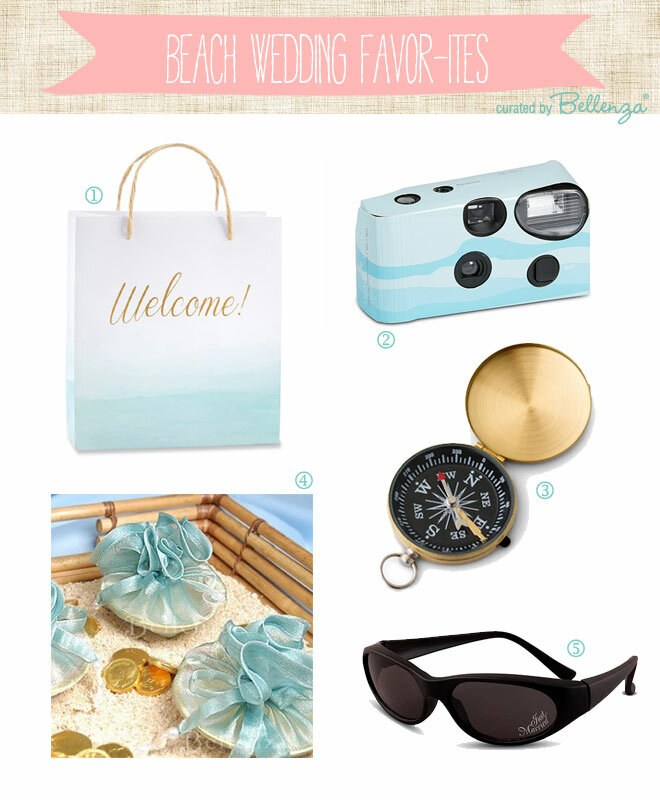 3 – Gold Compass Wedding Favor – Give this vintage-style keepsake from Weddingstar to remind guests how they witnessed your wedding vows by the sea. 4 – Seashell Favor Tray – We proudly offer this elegant gift item from our SHOP, handcrafted from real seashells. 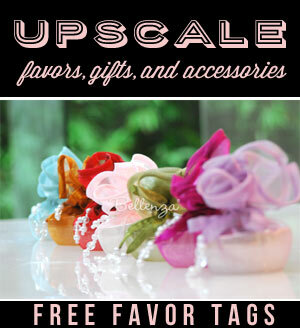 It makes a lovely trinket holder, candy or potpourri dish, or tea light tray. Head to the Bellenza SHOP for more seashell party favors. 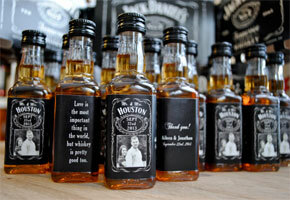 5 – Sunglasses for Guests – With these “just married” sunglass favors, all eyes will definitely be on you! Available at Weddingstar. We can’t say it enough: a Beach Wedding is a decorator’s dream. And after all the inspiration we’ve shared, it’s probably YOUR dream for your summer nuptials, too!